“Sunset” placed in the top twenty quilts as choosen by customers in Asheville Cotton Co.’s first Customer Quilt Show. It took me close to two years, working on and off, to complete my first large quilt. Previously, I had made a few quilts as baby gifts which are generally weekend projects. A quilt large enough for a queen-size bed I discovered is considerably more challenging. Part of the reason it took a while to complete, was the time I spent in organizing, and reorganizing the blocks. The original materials and base design came from a quilt kit my mom had given to me. I followed the first couple steps of the instructions, but then reached a point where I didn’t like how they were pulling the elements together. Fortunately, I have a large work table and could spread the pieces out for review. They were there for weeks. Each time I walked by the table I considered and often rearranged the pieces. Finally, I was happy with the layout and could finish up the sewing. When I got the top pieced together I took it down to my favorite quilt material shop, Asheville Cotton Company, and got terrific advice on fabric for the backing and border. They also suggested I do the actual quilting with a variegated thread. The look is great and makes the flip side of the quilt quite interesting. 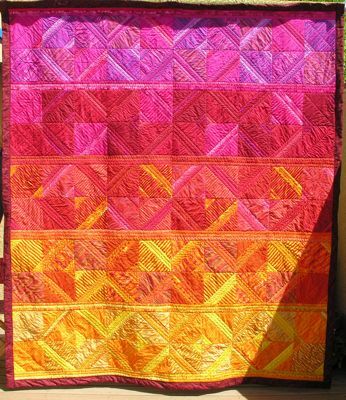 I used the block ends and extra strips of fabric to make the Sunrise Baby Quilt a few years later.